Famous for its spectacular chalk cliffs, the White Cliffs, Dover is one of Britain's principal cross-channel ports, and despite the opening of the Channel Tunnel to Calais, many visitors to the country still choose to arrive by ferry for the magnificent views of Kent's lovely coastline. Although many travelers pass through Dover on the way elsewhere, plenty of points of interest make this historic town well worth a visit. One of the most popular things to do while wandering the town center is visit the old town hall, Maison Dieu Hall, built in 1203 by Hubert de Burgh as a hostel for pilgrims. Like so much of England, Dover was heavily influenced by its Roman heritage, and you can explore a number of Roman-era attractions here, including the remarkable lighthouse on Castle Hill and the Roman Painted House. For centuries after the Romans left until WWII (when the town suffered severe damage due to its role as a naval base), Dover was a bulwark against attacks from Europe. Today, you can learn about this period in the numerous museums and historic sites in and around the town. The steep chalk cliffs of Dover, for centuries a proud symbol of the "splendid isolation" of England and also the first sign of home for returning sailors, are crowned to the east by the mighty castle. The western cliffs bear Shakespeare's name as King Lear ended here, and the much-used quotation invoked by the sight of the cliffs, "This precious stone set in the silver sea," comes from Richard II. The National Trust's Gateway to the White Cliffs Visitor Centre is the best place to begin sightseeing in the area and includes displays, interpretive signs about the area, as well as programs about its flora and fauna. It also offers superb views of five beautiful miles of coast and countryside, as well as of the maritime traffic on the world's busiest shipping lane. From the center, it's also possible to explore Fan Bay Deep Shelter, a remarkable network of tunnels built during WWII under the artillery battery above. Thanks to its stunning views over the English Channel, the White Cliffs are also extremely popular among hikers and cyclists, with numerous well-marked trails linking the area's main attractions (there's even an annual Walking Festival, as well as hiking programs for kids). Perched high above the English Channel, Dover Castle was started in 1168 by Henry II on the site of ramparts that were already some 1,000 years old. The central Norman keep, built in 1180, houses most of the castle's exhibits, including the Great Tower with its richly furnished chambers. Costumed guides, medieval feasts in the banqueting hall, and military re-enactments are all part of the fun. Also of interest are the ruins of the Roman Lighthouse and the church of St. Mary in Castro next to Colton's Gate, built from Roman bricks by the Saxons in the year 1000 and incorporated into the castle complex. Other on-site attractions include the superb Wartime Tunnels Uncovered. Built during Napoleonic times to provide protection from enemy fire, the tunnels under Dover Castle are open to the public and contain exhibits tracing their history. More recently, in WWII they served as HQ for the evacuation of British and French forces from Dunkirk. Another tunnel area to explore is the Underground Hospital, a reconstruction of the wartime surgery that served the many troops stationed in the area. The beautiful Victorian lighthouse perched atop the White Cliffs of Dover was built in 1843 and has the distinction of being used by Marconi for the world's first successful attempts at radio navigation. Built to warn mariners of the shifting Goodwin Sands while guiding them through the Straits of Dover, it's also famous as the first lighthouse in the world to display an electric light. The views of the English Channel are wonderful, and on a clear day, you can see all the way to France. Inside, interpretive displays showcase the work involved to keep the lighthouse running, including maintaining the unique mechanism that made the lighthouse flash (there's also an excellent on-site tearoom). The Roman Painted House was built around AD 200 and formed part of a large mansion used by travelers venturing across the English Channel. It's the finest surviving Roman Period House in England, with some 50 structures uncovered to date, including a number of unique painted walls (some 400 square feet of frescoes have survived the centuries) and elaborate under-floor heating systems. Also on display are a variety of interesting artifacts from Roman Dover. In the family visitor center in Market Square, the Dover Museum houses three floors of objects and displays recounting the town's rich history, from its Roman beginnings to the modern day. It's also home to the world's oldest known seagoing vessel, a Bronze Age wooden boat thought to be about 3,000 years old that is the focus of an excellent exhibit relating to that period of Dover's history. Other highlights include an impressive collection of Saxon-era artifacts and jewelry, as well as numerous scale models depicting the town at various key points in its history. A memorial to French aviator Louis Blériot, the first person to fly across the English Channel in 1909 in a "heavier than air" aircraft (more than 100 years after an air balloon had made the trip), is erected in Northfall Meadow, a small woods to the northeast of Dover Castle. The granite memorial itself is quite unique as it was built in the shape of Blériot's plane, which can still be seen in Paris at the Museé des Arts Métiers. A sister memorial marker has been erected in Calais where the pilot's adventure began. In St. Margaret's Bay, just four miles away from Dover, these six-acre sustainable gardens include a lovely cascade and adjoining lake; a grass labyrinth; an organic kitchen garden, with more than 40 different species of organic fruit and vegetables; and, of course, a tea room. Be sure to check out the award-winning Pines Calyx, a conference center built into the hill using centuries-old construction techniques. Directly opposite the main entrance to Pines Garden is St. Margaret's Museum with a good selection of WWII artifacts. Of particular note is Hellfire Corner. Named after the brutal air battles that took place over this section of Kentish coastline during the Battle of Britain, this excellent exhibit includes period costumes, artifacts, and an air raid shelter. Built for Henry VIII in 1540, Deal Castle (just 11 miles north of Dover) is widely considered to be one of the finest Tudor castles in England. It's also among the earliest and most elaborate of a chain of coastal forts that extends along the English Channel. Visitors can explore the entire castle - as much a stately home as it is a fortress - and afterwards stroll the pleasant grounds and gardens. Be sure to also spend time wandering the quaint medieval town of Deal, one of the famous defensive and trade towns that made up the Confederation of Cinque Ports (the town also boasts great walking and biking trails). This English Heritage site, just 15 miles north of Dover near Ramsgate, marks the place not just where Roman rule began in the British Isles, but also where it ended. The impressive ruin of the Roman town at Richborough was where the Romans launched their successful invasion of Britain in AD 43 and also where they departed centuries later after it was no longer tenable to rule the British. The extensive remains of the walls and defensive ditches are well worth exploring, and a fun boat trip is available (weather permitting) that traces the route taken by the Romans when they arrived. Best Western Plus Dover Marina Hotel & Spa: 4-star seafront hotel, afternoon tea, spa treatments, free parking. The White Cliffs Hotel: mid-range pricing, excellent service, family apartments available, tasty breakfast, lounge with fireplace. Loddington House: affordable bed-and-breakfast, wonderful host, walk to town and Dover Castle, homey feel. 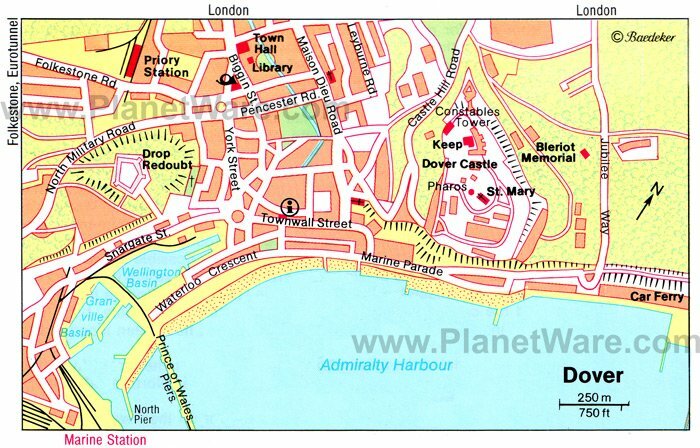 Premier Inn Dover Central (Eastern Ferry Terminal) Hotel: budget hotel, beachfront, comfy bed, free parking.